Equipment such as life-support system and other monitoring devices are being provided with modifications as per the need of small babies. Many equipment used for monitoring blood sampling, baby’s condition and body weight are being used on a large scale in hospitals. Nowadays with the increasing number of premature births, companies are developing special equipment that can help in treating various conditions in such babies. Increasing awareness about the availability of equipment in the market and rise in birth rate, especially in the developing is driving the demand for neonatal infant care equipment. Incubators are also being used to in the case of preterm babies. Technically advanced and smart incubators are also being developed by companies to provide protection from cold temperature, noise, infection, to provide oxygenation, observation, administration of medicines, and to maintain fluid balance. Some of the common diagnosis in neonatal intensive care unit include anemia, jaundice, respiratory distress syndrome, and neonatal sepsis. Hence, manufacturers are also looking for the most common problems among newborns and developing equipment accordingly. The problems also vary region-wise and country-wise, hence, companies are also looking for any particular problem that is very common among newborns in the specific region or country. As per the report by Persistence Market Research, the global market for neonatal infant care equipment is expected to see a strong growth between 2017 and 2024. 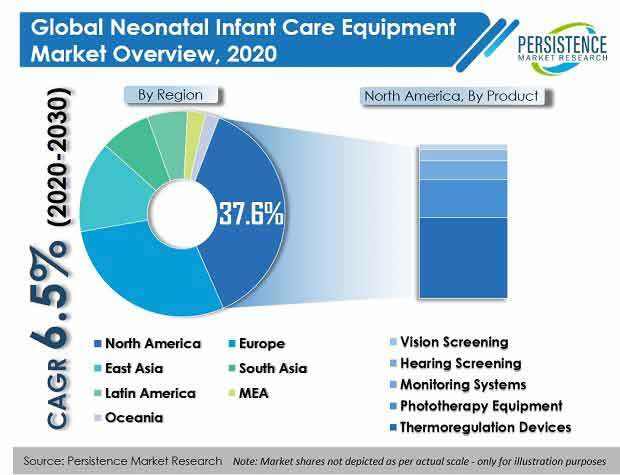 The global neonatal infant care equipment market is projected to reach US$ 2,686.7 Million revenue towards the end of 2024. Thermoregulation devices are witnessing significant growth in the market as infant thermoregulation is the most important for very sick infants who are suffering from the problem of hypothermia. According to the World Health Organization (WHO), more than 96% of infants born in developing countries weight less than 2,500g. Hence, hypothermia is the most common problem among infants. In such a condition, thermoregulation devices or technologies are considered to the most important in treating. Although incubators are considered as the most advanced warming device, it is very expensive and can also increase the risk of infection. This is also one of the major factors contributing to the growth of thermoregulation devices. Companies across the globe are also developing thermoregulation devices specifically priced and marketed for low-resource settings. The thermoregulation devices provided by companies also include training for end users and maintenance and repair of devices. Researchers across the world also concluded that protection against excessive heat loss and adequate thermal environment can play a significant role in the survival of premature babies. Government across the globe are also investing in hospitals to make it technically advanced. New equipment and devices are being deployed for taking care of newborn. Meanwhile, pediatric & neonatal clinics, and nursing homes are also using neonatal infant care equipment. The global population is expected to keep growing in the coming years. Moreover, countries such as India and China account for highest birth rates. Hence, the demand for infant care equipment is also growing in these countries. Meanwhile, in some countries where the death rate is overtaking birth rate and where the population is shrinking, governments are taking measures to the increase birth rate. Various initiatives by government also include providing better facilities for mother and child care. This is also likely to fuel the growth of the global neonatal infant care equipment market.